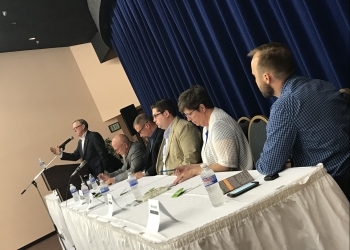 Several community officials discuss suicide, addiction, and prevention programs at the 2018 Suicide Prevention and Prescription Drug Awareness Summit Thursday in the Bartlesville Community Center. Members ranged anywhere from city officials to mental health professionals. Detective Jim Warring with the Bartlesville police department sat among the panelists. He says that everyone on the panel acts as a resource to one another and that they're all friends that make change together. iPads were a topic of discussion during the panel. Detective Warring and Matt Spencer with The Grand Lake Mental Health Center say that iPads allow patients to have 24/7 access to suicide hotline when a mental breakdown occurs. Bartlesville Schools Superintendent Chuck McCauley added that students have iPads in the school district to report instances that occur at the school and recognized Kerry Ickleberry and Sarah Rose for keeping an eye on student safety while the school continues to train faculty and staff to report any situations they see during school hours.